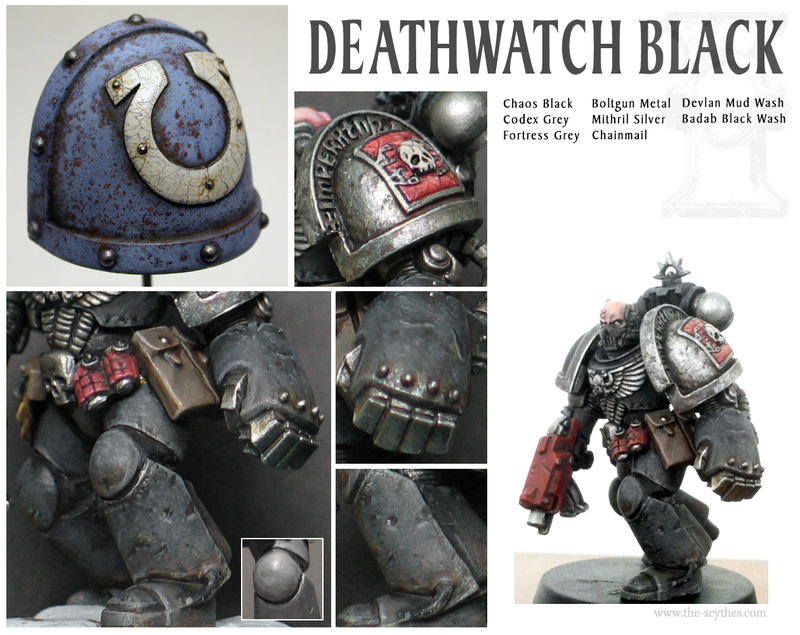 Forward into the next year; Scythes Deathwatch marines! I’ve long wanted to do a ‘truescale’ Deathwatch Marine, with my initial effort of Stavus in the Tenax project being a primer (currently redoing him and adding three more). 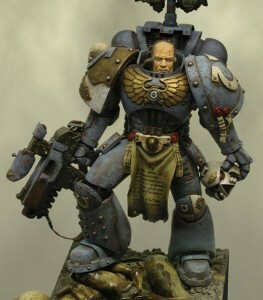 This marine has to tower over the Inquisition retinue, look imposing and also prepared, alert. I didn’t want to have him in an action pose, it’s too clichéd for marine characters and I’d rather a form of subdued power. When I posted a preview in the birthday post, my Deathwatch marine got a fair few comments/messages requesting my black recipe. For my first foray into grimy armor, I’d say it went over well with folks used to my crisp, smooth finishes. The following is how I went about it and what inspired me. Firstly, I don’t recommend this technique for an army, but several characters in a small Deathwatch squad would be a great show piece. I discovered this large scale marine project by accident a good year ago. I would love to know who did it, Sgt Someone found it! HERE. Eitherway, I liked the finish on the armor. It’s clearly stippled and sponged on, with a fair few chalks, dusts and washes going on in there. Unfortunately he’s huge.. so the artist can get away with doing a huge amount to really pack the detail. To meet what I wanted, the challenge was to paint in greys, layered stippling on a 38mm model. Yeah, I like jumping in the deep end. Admittedly he has a third more surface area than the average 30mm marine, thank heavens. 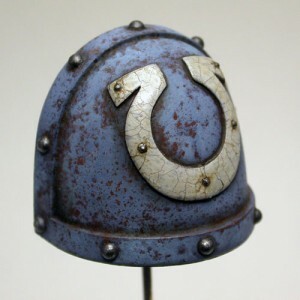 The best source image was the close up of the Ultramarines shoulder pad. I could see the under layers and how the original artist worked up the blue from original to dried flakes. The inset on the leg image shows the base grey I layered, then washed over with watered Chaos black. You can see layer upon layer of grime, wear and the classic scratch damage we all know and love these days. I think the most successful part was the power fist ‘knuckles’ and the beaten and worn metal shoulder, at scale it really comes together and ultimately I am most proud of that result. Ultimately this is a very intuitive style of painting, you cannot approach it in steps, more results. A couple of places a light drybrush then a few scuff marks.. looked great, so it was done and I moved on. The key thing is to create a depth to the paint on the armor, some areas more worn, others almost factorum new. I created a base grey, washed this with Chaos Black to the shade I liked, then attacked with stippling and weathering ‘damage’, using Badab to tone down the shading where necessary. Once done I hit it with Devlan nearer the lower edges, where washed grime would build up. It’s all to eye and really, by limiting your palette it makes you become creative and really use shading and shadow for a piece like this. There are still the reds to redo, I found a great guide or two on the web recently so I will repost an update then. Additionally he will be receiving purity seals and other details. I may even replace the grenades into single parts to better flow around his thigh. He also needs more than just a Scythes emblem on his right shoulder, I’ll figure out some Sothan accessories. I hope you gained some insight and see the layers and effects I used. There are no fancy powders, just paint, ink and some patience. You can find another version of this post on Bolter and Chainsword forum here. 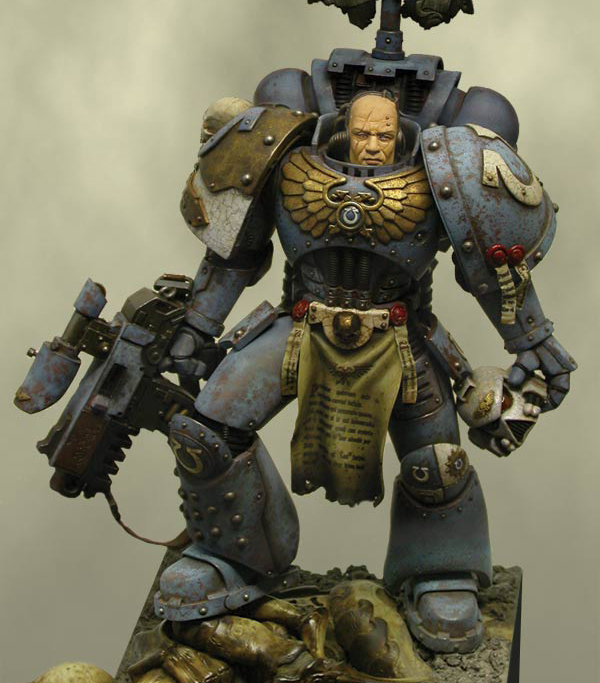 Site owner and creator, Sebastian has been updating and maintaining the Scythes of the Emperor webpage since 1997.